Camp Minnie-Mickey | Countdown to Extinction | Discovery River Boats/Radio Disney River Cruise | March of the ARTimals Parade | McDonald's Sponsorship in DinoLand U.S.A. and Other Early Attractions | Mickey's Jammin' Jungle Parade | Pocahontas and Her Forest Friends | Safari Village | Tarzan Rocks! 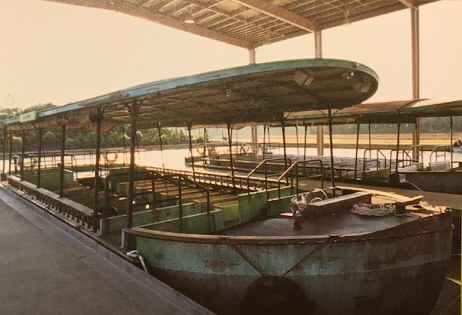 These battered-looking metal boats were an opening day attraction and could be boarded at either the Safari Village dock or the Upcountry Landing dock in the Asia section of the park. The boats were manufactured in Seattle and then distressed with bug splats, dents, mud, rust and bird poop. Names of the seven boats were The Darting Dragonfly, Manatee Maiden, Scarlet Flamingo, Otter Nonsense, Leaping Lizard, Crocodile Belle, and Hasty Hippo and each held 62 passengers. Several exciting show scenes were planned for the boats to sail past, mainly ones to promote the unbuilt Beastly Kingdom. There was supposed to be a unicorn in a misty glen, a fire-breathing dragon (identical in design to the one in the castle at Disneyland Paris) bolting out of a cave that was littered with defeated knights, and a Kraken churning up water in the river. The boats were slow to load and the lines were long. They were meant to serve as shuttles like the Friendship boats in Epcot but many guests were expecting a Jungle Cruise-type attraction. 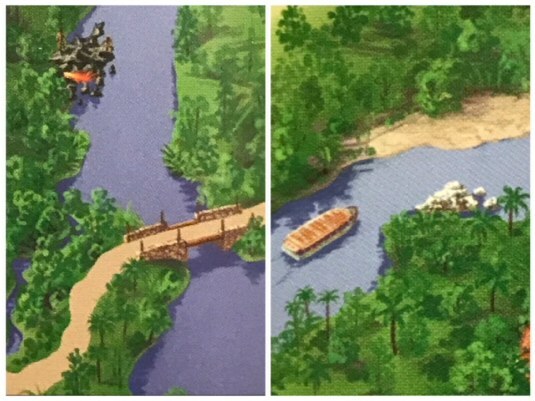 Guests were further aggravated because boats would often pass the dock they were waiting at (if you were waiting at Asia and a boat from Safari Village went past, it would not stop at Asia since it was on a round trip from Safari Village). Once on the boat, visitors could see a small waterfall coming out of rocks that looked like a dragon's mouth and sometimes encounter dragon fire and growling coming out of a cave near Camp Minnie-Mickey (The effect wasn't always working and I personally didn't see it when I was on the boat in June of 1998 but on a later trip to the park after the boats were gone, I could hear the dragon as I crossed the bridge to Camp Minnie-Mickey.) There were geysers near Harambe and fanciful fountains near Asia and Dinoland, U.S.A. An Audio-Animatronic iguanodon would also be encountered but it was removed in November of 1998. Perhaps because there was so little to see from the boat, a keeper would roam the aisle in the boat and show off "misunderstood" creatures such as emperor scorpions, leopard geckos, spiders and snakes. The park tried to emphasize that this was mainly a transportation option and not an attraction by changing the name of the boats to Discovery River Water Taxis in November of 1998. The taxis contained recorded narration instead of the previously live spiel done by the skipper. 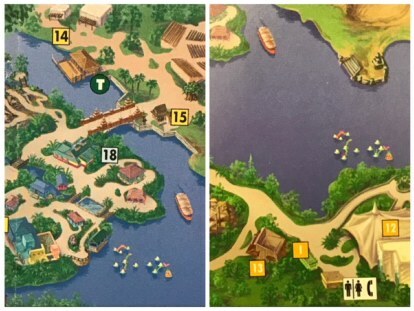 The two pictures above are from an Animal Kingdom map from June of 1998 (left) and the Guidebook for Guests With Disabilities (right). 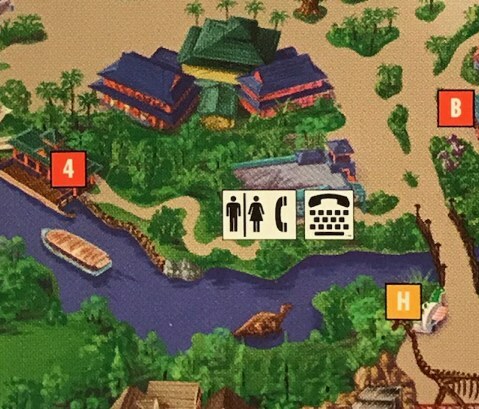 Notice how the placement of the water elements near Asia and Dinoland, U.S.A. differ. Once the boats no longer operated, none of the boat elements showed on the maps. The Upcountry Landing Discovery River Boat dock in Asia as seen in December of 1998. The boats became the Radio Disney River Cruise in March of 1999 and played commentary from Radio Disney DJs Just Plain Mark and Zippy, who were "broadcasting" from the top of the Tree of Life. The ride blasted the soundtrack, which contained non-stop patter from the DJs, animal facts, segments such as Minnie Mouse calling in and winning a contest and songs such as "Hakuna Matata", the movie theme from the live-action "George of the Jungle" film, "Eye of the Tiger" by Survivor and "We Will Rock You" by Queen. While there was certainly more to listen to on the boats, there still wasn't enough to see and the attraction closed on August 21, 1999. 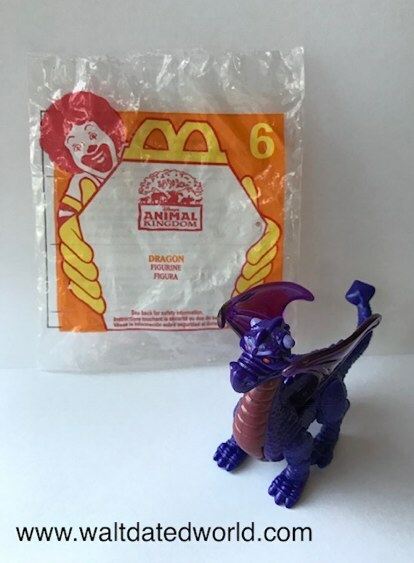 McDonald's released an Animal Kingdom Happy Meal set in 1998. 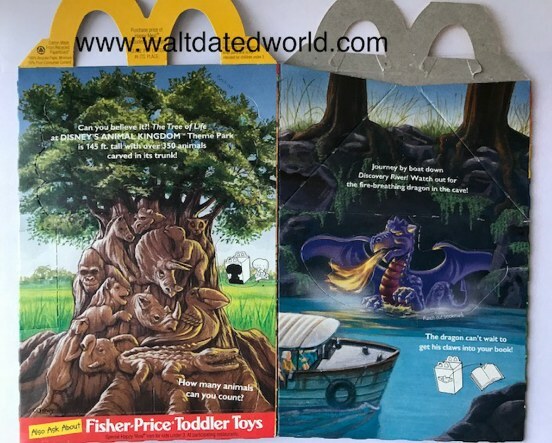 One of the boxes featured an illustration of the never-built dragon attacking a Discovery River boat and featured a dragon toy. The dragon looked a bit like an adult Figment on steroids! The ride also inspired a toy die cast boat with Goofy as the skipper. Parts of the iganodon later turned up at the Walt Disney Studios Tram Tour in Disneyland Paris. 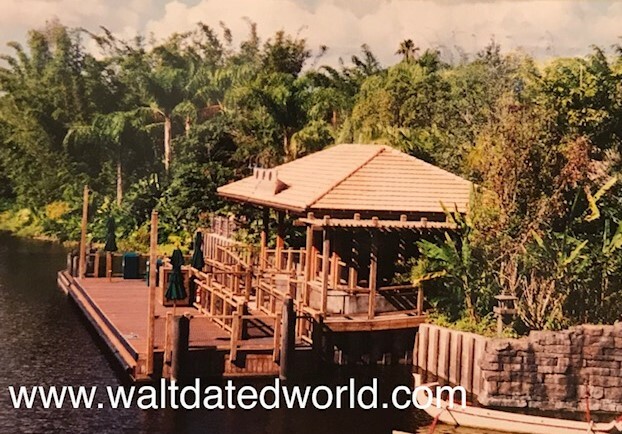 The former Upcountry Landing boat dock was later used as a character greeting area and the Safari Village/Discovery Island dock was used as a seating area. A boat sometimes would travel the river with characters onboard and the Otter Nonsense boat was later repainted and used to transport guests on the Seven Seas Lagoon to The Magic Kingdom.